Home > News > Event > Let’s Discuss Peace & Human Rights in English! Let’s Discuss Peace & Human Rights in English! Human Rights Now, a Tokyo-based international human rights NGO, will hold a course of English discussion sessions (eikaiwa) called “Let’s Discuss Peace & Human Rights in English!” like we have held in previous years. It’s designed for people wanting to practice their English discussion and people interested the topic of peace and human rights. This year’s course will cover ways that human rights and peace are connected, including recent hot topics such as the Article 9 debate, nuclear weapon disarmament, refugees, and women and girls trapped in conflict. Both beginners and people who have participated in earlier sessions this year can fully enjoy this year’s edition. *As the number of participants is limited, we encourage you to apply as soon as possible. 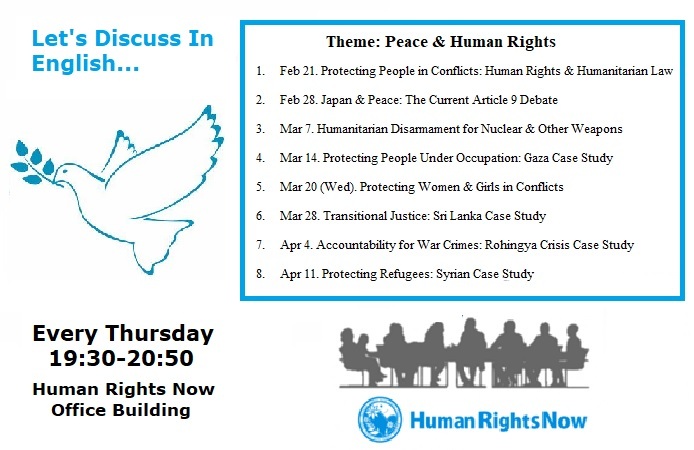 ■ Let’s Discuss peace & human rights in English! The purpose of this project is to improve your English skills and to learn about peace and human rights issues through English materials and to discuss the connection between peace, conflict and human rights in the world today. The course will examine the current situation of these issues from the perspective of protecting people in conflicts and promoting peace. This course is aimed at people wanting to learn how to express their opinions in English, as well as people interested in peace, conflict and human rights wanting to learn the fundamentals of English in order to deepen their knowledge of the field. It is also for anyone wanting to improve their English skills generally. One of the teachers, Christopher Cade Mosley (going by Cade), is a staff member of HRN and a New York State Attorney. He previously worked in the field of environmental law and international human rights law, and he has taught international human rights to Myanmar law students. Everyone, from students to workers with a basic understanding of English is welcome. We are looking forward to your participation! ★People willing to attend several lessons can buy a multi-lesson coupon. * A ¥1,500 cancellation fee will occur from one week before each lesson. * All the lessons will be conducted in English. We advise you to bring a dictionary with you for every lesson. To register, fill out our online application form. You can also send a mail to the organiser (cade.mosley@hrn.or.jp) with ① your name, ② contact information, ③ lessons you want to attend, ④ status (General or Student) to apply for the course.